In the previous article, I had shown you a portable defrag tool, called Defraggler. This article will show another portable defrag tool called JKDefrag. 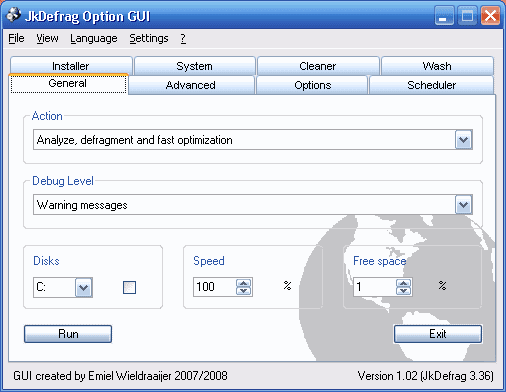 JKDefrag a freeware by kessels, is a portable disk defragmenter and optimizer for Windows 2000/2003/XP/Vista/2008/X64. It means that you can put it inside floppies, USB disks, memory sticks, and anything else that looks like a disk to Windows. The backup process is automatic, and JKDefrag is very easy to use, fast, low overhead, with several optimization strategies. There is also an advance GUI made available by codestuff. It enables users to easily use JkDefrags powerful defragmentation operations, schedule defrags, perform system file defrag operations on startup, as well as set a wide spectrum of defrag options.